How to make a shamrock shake is an easy recipe that is perfect for kids. 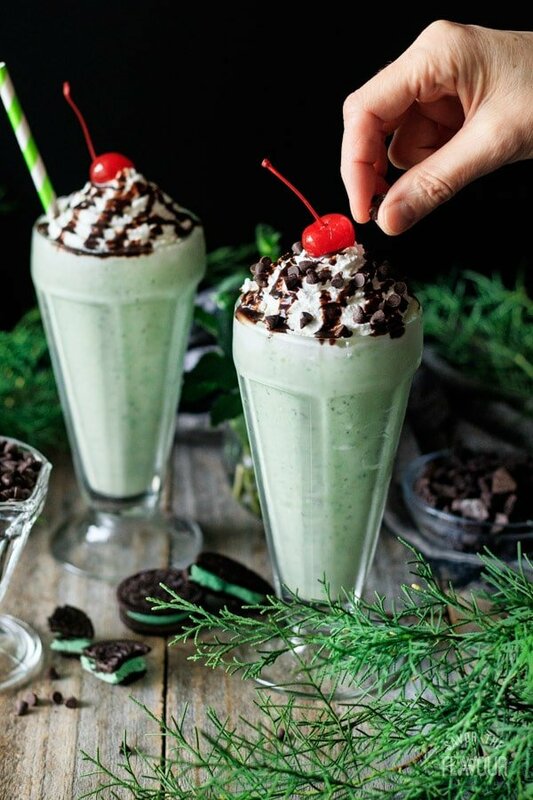 This homemade version of McDonald’s famous St. Patrick’s Day shake is a no bake dessert full of fresh mint, Oreo cookies and vanilla ice cream. This simple, tasty DIY shake is made for two and is so refreshing in the spring or a hot summer’s day. This post was originally published on March 1, 2018. 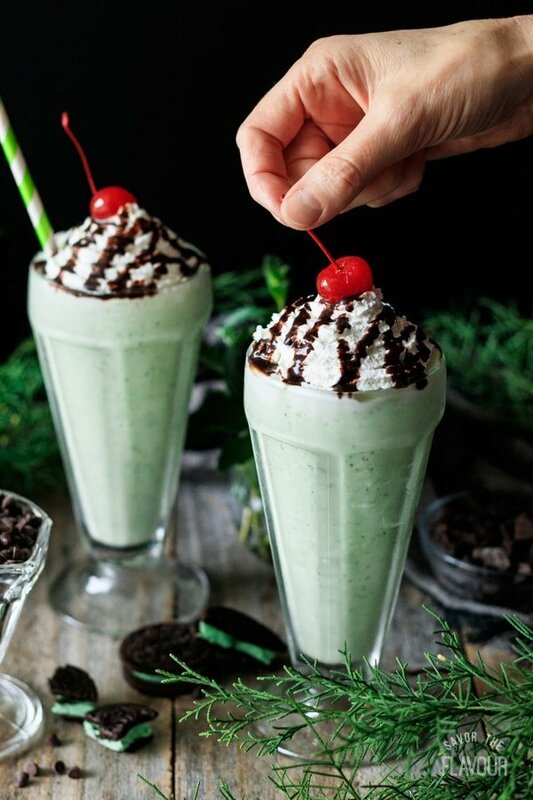 Shamrock shakes are just the thing to whip up when you want something cold and minty. The best thing about this recipe is you don’t have to wait for McDonald’s to put it on their seasonal menu. 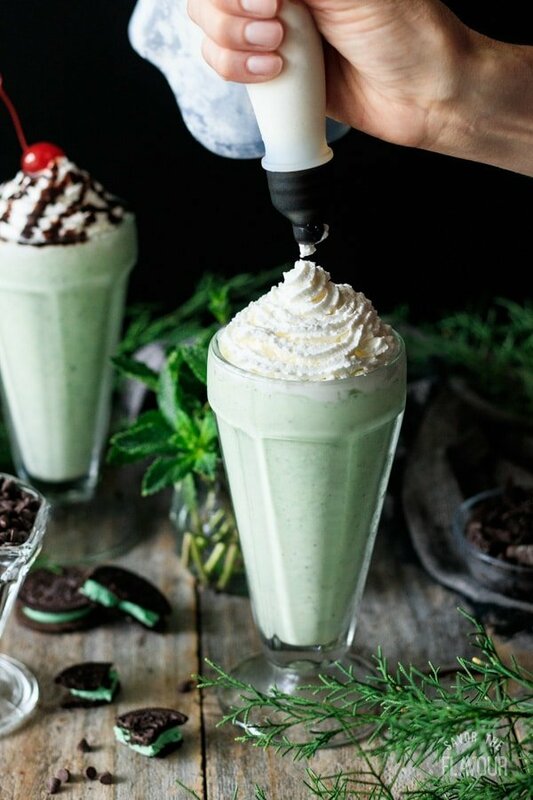 Since it’s typically only available for 3 to 4 weeks at certain locations in the United States, Canada and Ireland, having this recipe can satisfy your shamrock shake cravings any day of the year. I just love a thick, creamy shake! Don’t you? And it’s so easy to achieve. Just use good-quality vanilla ice cream, plus whole milk, and you will have a winner every time. 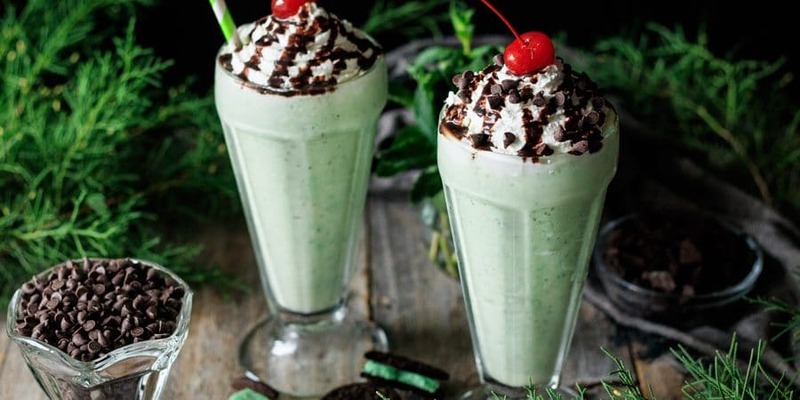 This shamrock shake recipe has double the mint, so that makes it twice as good. The first dose is from the mint Oreos, and the second is from the mint leaves. What ingredients are in a shamrock shake? Since you use a blender to make a shamrock shake, I thought you’d like to know another way you can clean your blender. Pour in hot tap water and add some dish soap. Be careful not to overfill! Put the lid on and blend, keeping your hand on the lid to prevent overflow. The spinning cleans the blades and sides. Rinse with hot water and air dry. Gather all the ingredients for the milkshake and the garnishes. Chiffonade the mint by stacking, rolling, and slicing the leaves. Finish by chopping the mint a bit smaller. Remove the mint filling from the Oreo cookies, and break them up into smaller pieces. (Reserve the cookie part for another use, like a topping, or just eat them.) Then, put the ice cream in the blender. Place the mint Oreo cookie filling on top. Pour in 1/2 cup of whole milk. If you want, add 1/2 of a banana. It makes the shake naturally sweeter. I left it out of the picture because I accidentally used the last banana up earlier that day. Add the vanilla, a couple of drops of food coloring, and the mint leaves. Put the lid on and blend until the desired thickness and color. Add the extra 1/4 cup of whole milk if the shake is too thick. Pour into two tall glasses and garnish with homemade whipped cream. Drizzle on chocolate sauce, and add a cherry with a stem. Sprinkle on some chocolate chips and serve immediately or place in the freezer for up to 30 minutes. 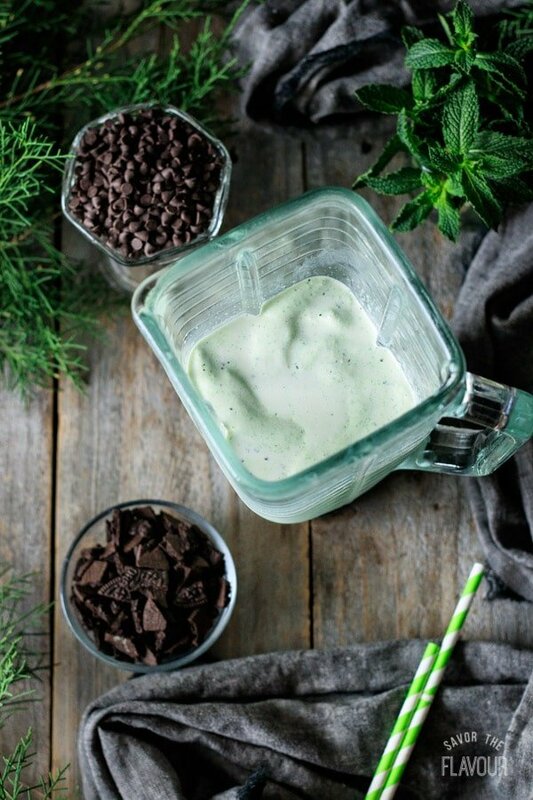 Use high quality ice cream and whole milk for the richest tasting shakes. No vanilla ice cream? 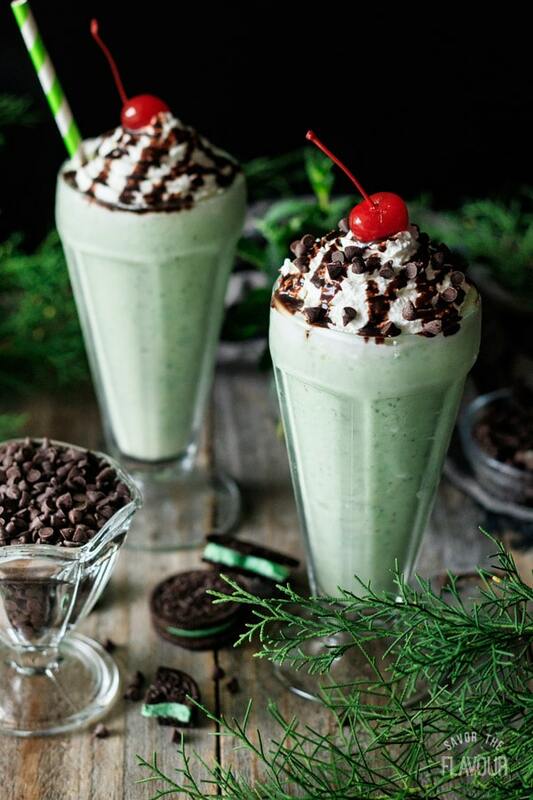 Try mint chocolate chip or cookies and cream. Chill the glasses ahead of time so the shakes stay thicker and colder longer. Don’t have fresh mint? Swap it out with 1 teaspoon mint extract. Don’t want the whipped cream? Top with chopped Oreo cookies. Want to rim the glasses? Use marshmallow fluff and green sprinkles. Want a fancier look? Drizzle chocolate sauce in the glass. Freeze to set the sauce, then pour in the shake. Want it thicker? Use a little less milk. 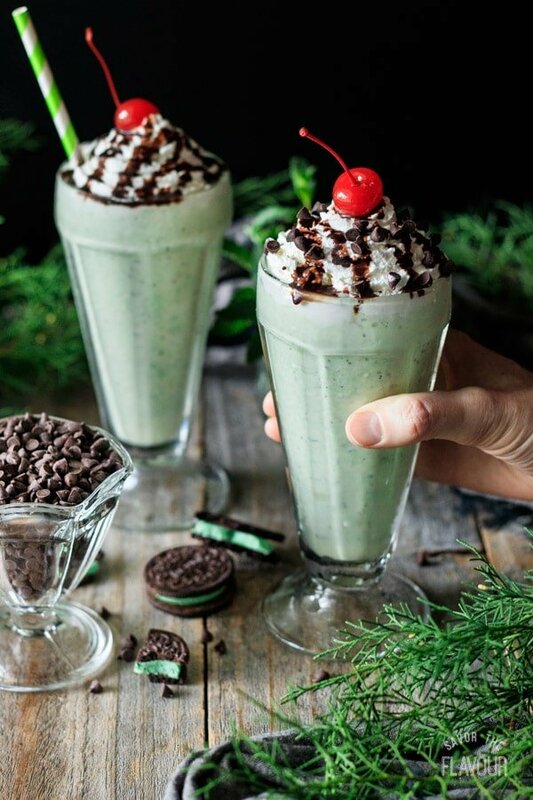 Share your shamrock shake with someone special, or make up another batch and gather the whole family around. It’s just the thing to serve on St. Patrick’s Day or on a hot summer’s day. 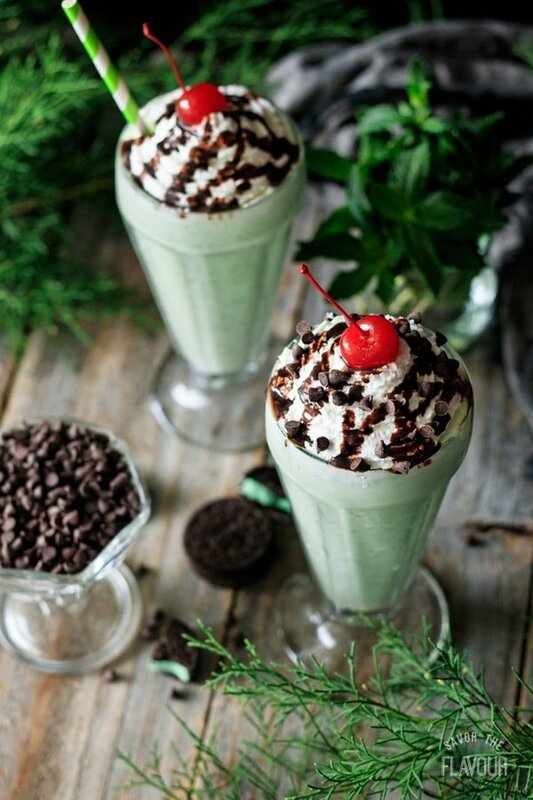 You’ll have plenty of mint Oreos left to snack on while you enjoy your minty milkshake! 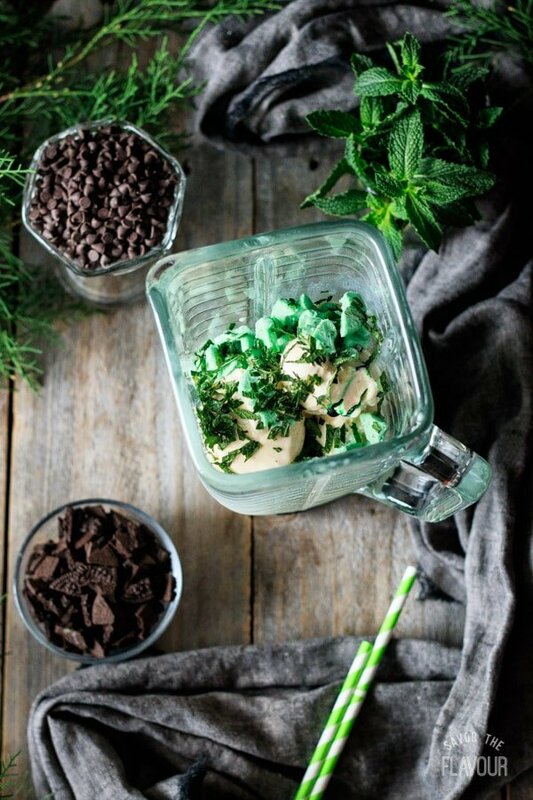 Craving more St. Patrick’s Day treats? Check out these delicious recipes. 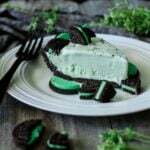 No Bake Frozen Grasshopper Pie: a make ahead mint Oreo dessert. 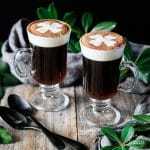 How to Make Non Alcoholic Irish Coffee: a quick Irish coffee drink. Easy Homemade Whipped Cream: waaaay better than the canned stuff! Did you make this shamrock shake? Please leave a star rating below the recipe to share how you enjoyed it. Wash and pat dry the fresh mint. Stack the leaves, roll them up, and slice into ribbons; then mince into smaller pieces. Put 8 scoops of vanilla ice cream, the Oreo filling, and 1/2 cup whole milk in the blender. Slice up half a banana and put it on top of the Oreos. (This step is optional; it makes the shake naturally sweeter.) 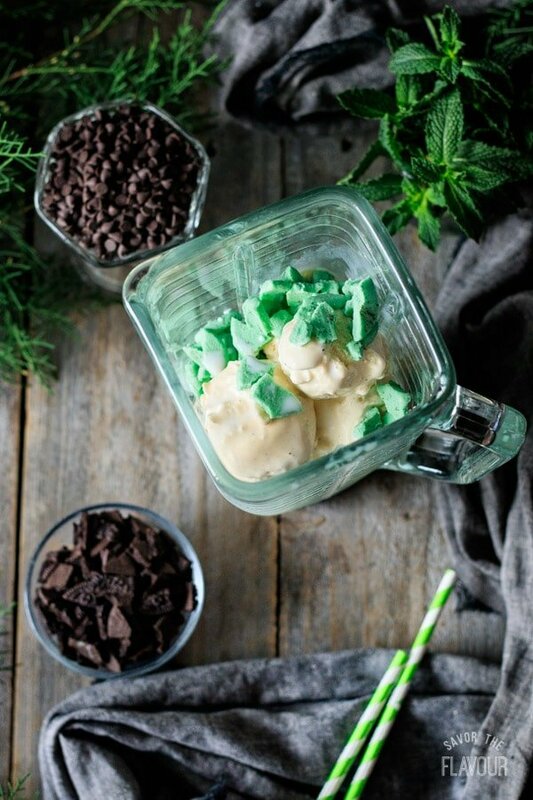 Add the vanilla, chopped mint leaves, and the green food coloring. Blend until the desired color and thickness. If needed, add the extra 1/4 cup of milk. Pour the milkshake into two tall glasses. Pour the cream and sugar into a bowl and whip to stiff peaks with an electric mixer. Put the whipped cream in a piping bag fitted with a star tip. Pipe the whipped cream slowly in concentric circles on top of the shake. Top with the chocolate syrup, mini chocolate chips, and a maraschino cherry. Serve immediately or put in the freezer for a few minutes so it doesn’t melt. Make a milkshake bar by putting out bowls of different toppings. Try mini chocolate chips, chocolate syrup, cherries with a stem, whipped cream, green or chocolate sprinkles, or crushed Oreos. 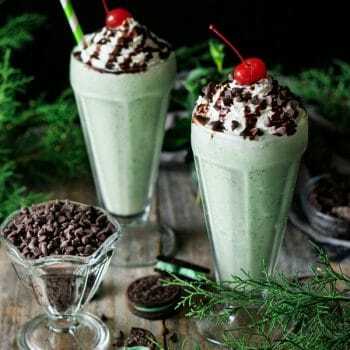 If you want to make this ahead, the milkshakes can be placed in the freezer for up to 30 minutes. If you add the Oreo cookie and filling, it will give the shake a brownish tint. 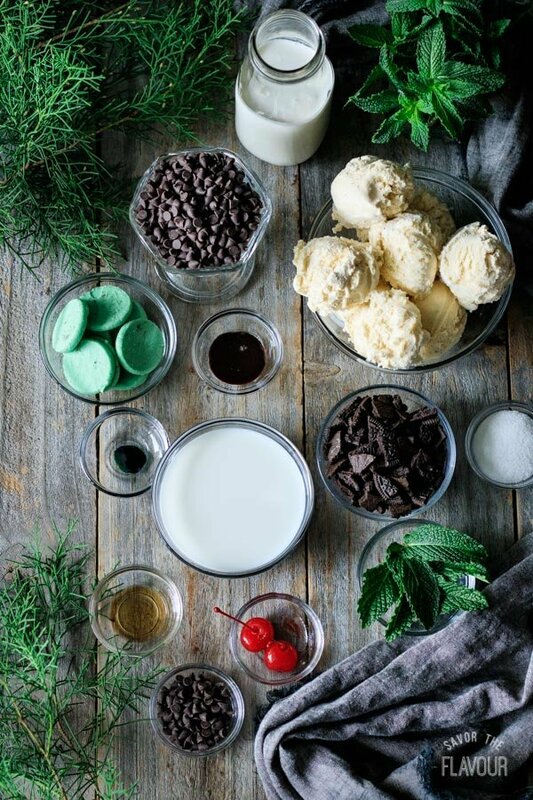 I love mint desserts, especially when it’s paired with chocolate. Thank you for stopping by!